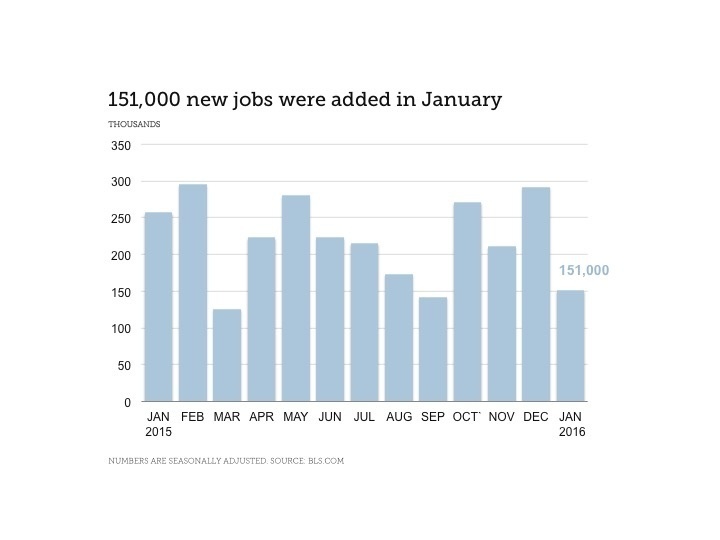 The latest jobs report from the Bureau of Labor Statistics shows 151,000 new jobs were added in January. Over the past three months, job gains have averaged 231,000 per month. The big news this morning is our national unemployment rate, sitting at 4.9 percent, is the lowest it has been since 2008, according to BLS’s February 5 report. The professional and business services sector added 9,000 new jobs month-over month. While this number is significantly less than previous months, industry experts say this will not be an ongoing trend. They point to 2015’s performance that saw 2.65 million new jobs added, the second best year in terms of employment gains since 1999. In January, the finance sector added 18,000 new jobs, with most of those gains occurring in finance and insurance (+11,200), according to BLS’s Feb. 5 employment summary. Finance and executive job candidates can find plenty of career opportunities in the current labor market. For example, the keywords “financial analyst” and “finance manager” yield nearly 35,000 and 60,000 search results respectively on LinkedIn’s job site. Degree holders in accounting, finance, and IT are among the most sought-after job candidates, according to several HR surveys. Here are the latest average salaries for key finance positions. But as a job seeker, what are some of your considerations in deciding which industries you may want to work in? And if you’re a recruiter/employer, how are your selling points changing amid the new developments that are affecting the business climate? Does your company belong to a high growth industry such as healthcare, construction, or professional and business services? There are signs that 2016 may be a lot different than the last couple of years—2014 and 2015 certainly saw robust employment gains for American workers. Last year, the U.S. economy created 2.65 million new jobs, the second best year in employment gains since 1999. But the economy also appears poised for another recession in 2016, according to a few Wall Street firms and prominent business figures. When looking for new opportunities, finance and executive job candidates may want to consider high growth sectors that, according to BLS, have added the most number of jobs. As the thinking goes, such industries may provide more stability in case another recession strikes. Senior analysts, managers, and executives will need to continually acquire new skills to stay relevant to their employers. Many companies are eager to implement better business practices that improve their global competitiveness. Another key consideration for both job seekers and employers is salary. Offering the right salary ensures employees will feel appreciated and retention rates will go up. To see the latest salary figures, download our free 2016 Salary Guide.